Virtual home tours are a marketing tool for real estate agents that let you add content to your site and put your listings in front of qualified home buyers at the same time. But Mouse House Tours are search engine friendly and they appear on YOUR site. So the more tours you post, the better your search engine ranking. And you know that high search engine rankings are key to selling more with less effort. You can post unlimited virtual tour details and pictures with Mouse House Tours. Online home buyers will have access to all the information they need, so when they contact you they’ll be closer to buying. Not only are your featured listings shown on your site but they will also appear in the Real Estate Listings Directory on Mouse House Tour's web site. 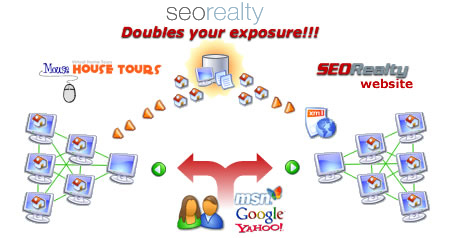 Internet searchers will have double the chance to see your listings online!